predict the ecosystem effects of atmospheric nitrogen deposition in forests, we need better understanding of the fungal adaptive responses that link carbon conversions to nitrogen dynamics. Some Basidiomycota clades have evolved the capacity to develop mass flow nutrient channels—cords—in response to nutrient context. Rapid bidirectional nutrient transport in cords enables these fungi to operate extensive and persistent resource supply networks, and to exploit the spatiotemporally uncoupled carbon and nitrogen resources of the upper soil horizons of the forest floor. Both the initiation of cord development and the velocity, direction and magnitude of amino acid flows within the corded network are regulated in response to the amounts and geometry of its carbon and nitrogen supply. Predictive models of fungal metabolic, physiological and developmental responses to environmental nitrogen, at cell and organism scale, can be realistically parameterized with data from experimentally manipulated saprotrophic mycelia in microcosms and ecosystems. 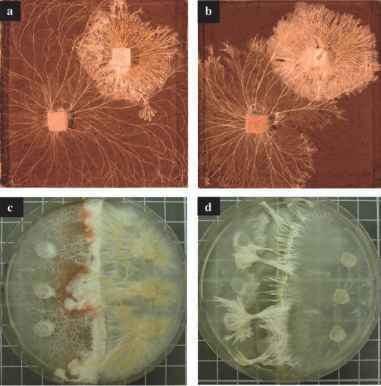 In future, the whole-genome sequence of the basidiomycete cord-forming wood decay fungus Serpula lacrymans will provide a model for -omics technologies to dissect the extracellular and intracellular nutrient responses that underlie the functions of basidiomycete networks in ecosystems.